Some racing series are easier to understand than others, but to put it mildly, F1 is about as technically complex as rocket science. With 500 members of each team spending millions upon millions each year to gain an advantage. But if you thought you had managed to wrap your head around the way things work, think again, because the series is undergoing a major overhaul of its technical regulations for the 2014 season. Of course, the biggest change is a switch from naturally aspirated 2.4-liter V8 engines to turbocharged 1.6-liter V6 powerplants, but that's not the sum total of the shift. The cars' hybrid component are set to play a bigger role, the aerodynamic regulations are changing, as are the exhaust system limitations and a whole mess of other details. It's enough to make your head spin at 20,000 rpm. Fortunately the BBC has put together this handy little video interviewing the experts and breaking down the changes into layman's terms that even we can understand. Watch the handy three-and-a-half-minute video primer below to get yourself up to speed on next year's F1 regulations. F1 is supposed to be the ultimate expression of a racing car and technology. Not slowing them down. Loosing those blasting sound because of the turbo isn’t right. Because that’s what got me attracted to F1 cars in the first place. The thrill wouldn’t be there anymore. 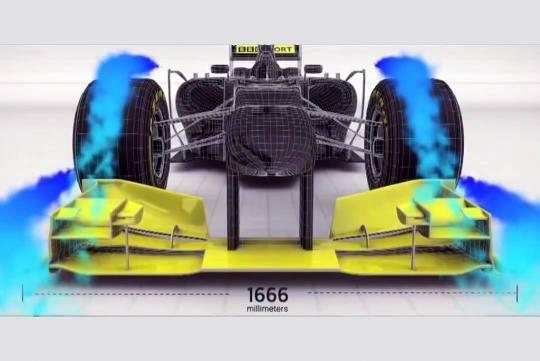 Less aerodynamic pressure, less traction? It will be an interesting watch for next year, F1 2014. Let’s just see how “well” it turns out as a whole.